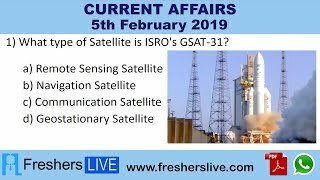 Current Affairs 5th February 2019: Instantly obtain Latest Current Affairs 5th February 2019 with all essential info, Be the first to know all the Current affairs 5th February 2019 top news, Major Issues, Current happenings, Important events in National as well as International level with clear explanation. For all competitive exams and Interviews, equip yourself with the Latest Current Affairs 5th February 2019 granted here. The Brihanmumbai Municipal Corporation (BMC) has linked all its reserves (in fixed deposits), totalling Rs.52,635 crore, to infrastructure projects of Mumbai, Maharashtra. The BMC had borrowed around Rs.3,000 crore from fixed deposits (FDs) towards its projects but ended up needing just Rs.574 crore. It plans to borrow Rs.5,708 crore from FDs for its immediate needs and has set aside Rs.22,902 crore for committed liabilities. The Karnataka Ministry for Youth Empowerment and Sports said that he has sought Rs.500 crore for the sports promotion and to build infrastructure facilities in the State Budget for 2019-20. Four divisions, the coastal region, Bengaluru, North Karnataka, and Hyderabad Karnataka, have been identified for sports promotion. The State government is yet to release Rs.5 crore for providing incentives to talented sportspersons and achievers.